I got my first hens in 1998. I was living in Seattle at the time, Beacon Hill, in a house we called the Hen House. Not because we had chickens. Bill and I found the remnants of an old Chinese restaurant sign, written in that funny chopsticks font, on a street corner. Being hoarders, we took the sign home and hung it on our porch awning. The word in chopstick font, cut off in the “N” area was HEN. Then I got chickens. Maybe it was a sign from the universe. Anyway, I didn’t know anything. I remember feeding them cornmeal. 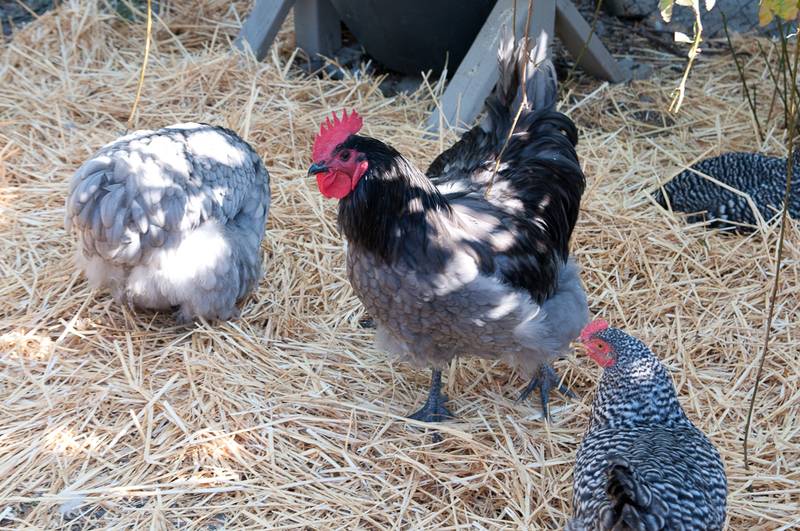 Only later did I figure out they will lay more eggs if you feed them actual chicken food, specially formulated. I also built a very questionable chicken coop. This type of construction would continue until I finally figured out that carpenters/builders are worth their weight in gold, and make things look beautiful–and can make a fully functional (ie predator proof) coop. Since that first flock, I’ve had several more, but none feel quite as special as my current flock. When I got pregnant with my daughter, I was so sick and tired, I couldn’t do anything. Including shutting the chicken coop up at night. I lost that flock to predators–raccoons? oppossoms? I don’t know. But there were feathers everywhere, and I had to face the facts: my life as a mom wasn’t going to be as easy as it was when I was single and able to do everything on the farm that needed doing. Fast forward two years, and I have a new flock of hens. Here they are. Some came from a friend who raised them from chicks, some came from Dare 2 Dream Farm, which sells chicks and chickens, coops, and cool t-shirts. The pullets we got from Dare 2 Dream started laying a few weeks ago! Here’s the nest o’eggs. 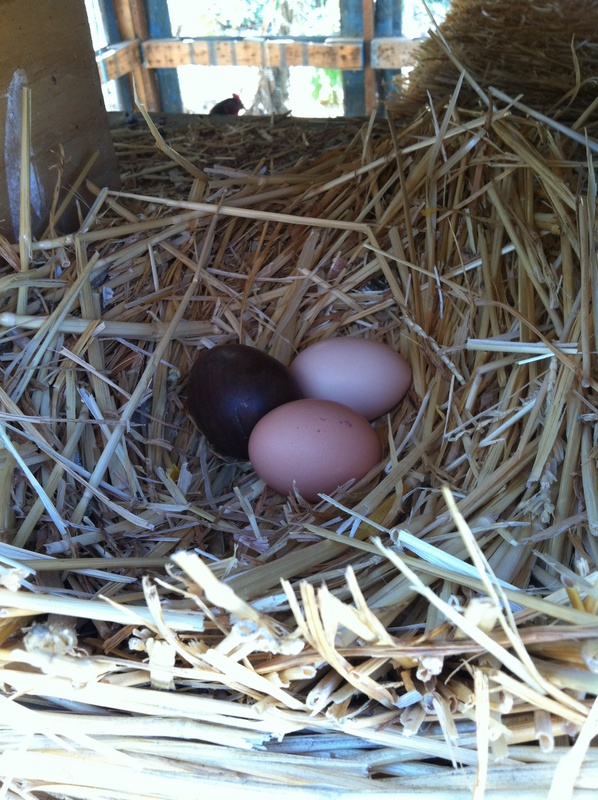 Note that the dark brown one is a wooden egg, which fools the girls into thinking no one (no one!) is taking their eggs. Sneaky. Post-baby (I have a toddler now, I’m told), the chickens feel so right, so good. They are easy to care for (just some feeding and cleaning). Putting them to bed, shutting their door, is part of our bedtime ritual now. Frannie says, Goodnight chickens, and helps shut the door. I know, it’s sick how sweet that is. 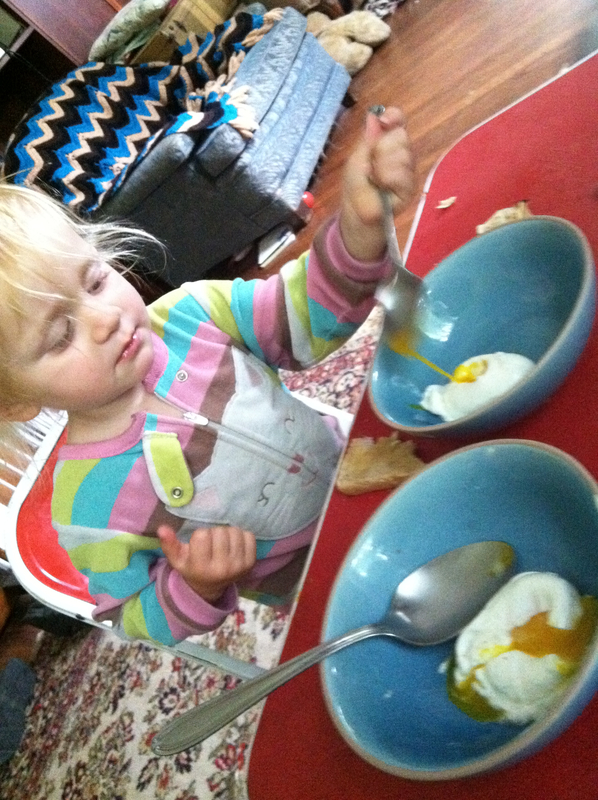 And…eggs. We like ours poached. Served on a small rickety table. We eat them in our pajamas. They are the Best Eggs Ever. If you have any chicken questions, and you live in the Bay Area, I’ll be at the Biofuel Oasis’s Harvest Festival at 3pm on September 21. The BFO is having lots of fun events that day, like a honey tasting and kombucha making class. Here are the details.